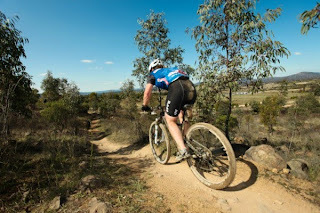 Last weekend I made a quick trip to Canberra to see what the terrain could be like for the worlds. A couple of months ago I found a 7 hour race that fitted nicely with my plans. My Mother joined me for the trip. We left Wellington at 6.45am on Saturday morning and finally arrived in Canberra about 1pm Australian time - wild life count, one dead Wombat! After a quick supermarket stop it was off to Stromlo Forest to get a practise lap in. I was really surprised how wet the track was. It had rained all week and the hill was literally weeping - lucky we have had a lot of rain as this didn't phase me. There was a lot of panic from the Australians, an apology for there being mud at the race briefing, and the race marshall's putting wooden planks over the worst of the mud! The race started at 7am on Sunday, with a very cold 3 degree temperature. The day was sunny but cold. I still managed some tan lines though. The first lap was a total pain. The course headed into single track far too early and there were very polite queues waiting to enter. The standard of riding was very high, everyone was polite when passing or being passed - a refreshing change from the aggression of Moonride or Daynight Thriller. The course was neat, with lots of variety and plenty of rocks. This required concentration and so the time just disappeared. The course really didn't suit me as in the 10km lap there was 200m of climbing all at once, I am much better with a bit of undulation. By the end of the day the most of the muddy sections were unrideable however the downhill was still just fantastic. I didn't have a good day and I didn't have a bad day, my head wasn't quite in it, and the early start the day before took its toll. I finished 7th out of 17 women and my only regret is deciding not to complete an 11th lap, if I had done this I would have come 4th. The field was strong with the first 3 finishers all contenders for the world 24 hour solo world title. We headed back to Sydney straight after the race and I was home by 3.30pm on Monday.